The countdown to the holidays is on. With just 3 weeks until Christmas and 4 weeks until New Years you need to get a handle on your party planning; now is the time to start. But don’t panic, below is a great party planning checklist with tips to make your entertaining the best it’s ever been. Pick your date and make an invitation list. Keep in mind how much space you have and do not worry about over-inviting as not everyone will RSVP with a yes. If themes are your thing, pick your theme and work your decorations around that theme. Secret Santa, Snowmen and Ugly Christmas Sweaters are always popular. Themes can be a lot of fun and are great for corporate holiday events as well. Create & send out your invitations. This can be done via mail, e-Mail or even phone calls or a combination of any/all can work for your party. Plan your menu – make sure you have enough choices for all of your guests, keeping in mind anyone with special dietary needs. Make your shopping list and organize any recipes you may be using to ensure you have everything you need to make your dishes. Line up any rentals or wait staff you may need to help during the party. There are plenty of companies that can provide local rentals for chairs and tables or you can enlist the help of high school students to help replenish drinks, remove trash and help in the kitchen. Pull out all the dishes, china and linens that you will be using and clean or launder anything that needs to be freshened. Or be sure to contact your caterer to make selections and finalize everything you will need them to bring or rent. Do a first round shopping for things that you can prepare ahead of time and freeze. Clean your house thoroughly and maintain it during the week, or have your cleaning crew do a thorough cleaning during this time. Rearrange any furniture that may need to be moved or might be in the way of entertaining and traffic flow. Purchase any additional serving pieces you may need that you don’t already have. Stock your bar with several alcohol selections, keeping in mind the guest you have invited and what they may look for with regard to refreshments or review the selections with your caterer. Consider a special “signature drink” for your event that works with your theme. Some experts say to notify the neighbours to alert them to any noise or parking issues that may take place. Use your judgment on this based on your relationship with your neighbours – hopefully they will be part of the celebration! Decorate and arrange candles, centrepieces and anything else that is part of the decor that is not already up, such as your floral arrangement. Remove personal items from public areas, such as bathroom medicine cabinets. Create a clean-up kit in case of spills and stash it somewhere out of the way, yet handy in case you need it. Make sure you have a place to stow your guest’s belongings like winter coats, bags and purses that is convenient and accessible, such as a hall closet or first floor room, particularly if your theme includes a Secret Santa. Finish your grocery shopping and check your recipes to make sure everything you will need is purchased. Confirm with your caterer or staff if you have hired them. 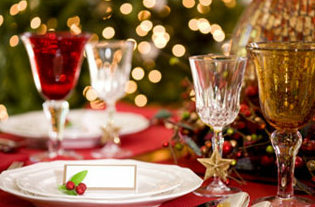 Set the tables and place chairs around for seating or direct your catering company’s staff in placement of everything. Finish cooking all of the food ahead of time if you can. Get dressed and begin greeting your guests as they arrive! The holidays can sneak up on us, but being organized and planning ahead will help alleviate a lot of your stress and help make the season fun and exciting. If you would like more help with planning your holiday party please contact Taylor’d for Taste Personal Chef Service for help.